Harmonic patterns offer high-accuracy trading signals with the potential to make significant profits. The trading signal will show the potential reversal of the trend to buy when the price is oversold or selling when the price is overbought. To find out how to trade using these Harmonic Patterns, we have previously studied basic harmonic patterns, among others; patterns AB = CD, Butterfly, Gartley, Crab and Bat. Next, we will discuss one more, namely the Cypher Harmonic Pattern. The Cypher Harmonic Pattern is a price pattern on the chart that indicates potential trend reversal. Trading signals can be confirmed when the conditions for the formation of the Cypher Harmonic Pattern are met. The Cypher Harmonic Pattern is unique when compared to other XABCD Harmonic Patterns (Butterfly, Gartley, Bat and Crab) because of the position of the upside down legs. Generally, the position of the first wing is sharper than the second wing. However, in the Cypher Harmonic Pattern precisely the position of the second wing is sharper. In the bullish version, the second wing (point C) is higher than the first wing (point A). Likewise in the bearish version, the wings are both more protruding than the first wing. Point C is sharper than point A as an indication that the swing at the foot of XA will depart again with relatively equal strength, even though it was corrected (retrace) on the AB line. That is the reason why prices will re-slide in the direction of the XA foot trend after the price retrace back to the CD line. Because of this uniqueness, Cypher Harmonic Patterns are relatively less commonly found than other XABCD Harmonic Patterns. Even so, according to the inventor, Darren Oglesbee, the accuracy is claimed to be the highest. In the bullish version, foot XA is drawn from the lowest price point that moves to a significant high (swing low). On the contrary, in the bearish version, foot XA is pulled from significant swing high. The AB line is the Fibonacci retracement of 0.382 to 0.618 from the XA foot. The BC line is the Fibonacci departure of 1,272 to 1,414 from the XA foot. The last leg (CD) is the 0.786 retracement of the XC swing. Ideally, all conditions of the above regulations are fulfilled appropriately so that the resulting trading signal has high accuracy. However, in practice Fibonacci retracement conditions may still shift slightly with the risk of reduced signal accuracy. The Cypher Harmonic Pattern can be applied to all timeframes and all types of Forex pairs. It's just that, novice traders better learn to recognize this Harmonic Pattern on intermediate timeframes like H4 or Daily before applying it to a lower timeframe. The goal is that the signal accuracy is high enough and avoid the risk of false signals. On GBP / USD (H4) chart above, the Cypher Harmonic Pattern successfully indicates a bullish reversal (reversal of the price from descending to ascending), even though the legs do not meet the requirements perfectly. However, at least the characteristic of this pattern where point C (second wing) is higher than the first wing at point A, is fulfilled. Generally, you can use the Cypher Harmonic Pattern trading signal to open a position when the price approaches the 0.786 retracement of the XC swing. In the picture above, the price turned out to be reversed before reaching the last foot retracement condition. This is still normal because the market moves not on the pattern on your chart, but rather the dynamics of demand and supply. In order not to be late in anticipating a reversal, learn about reversal candlestick patterns. The aim is to confirm the trend reversal as the candlestick closes at certain price points. 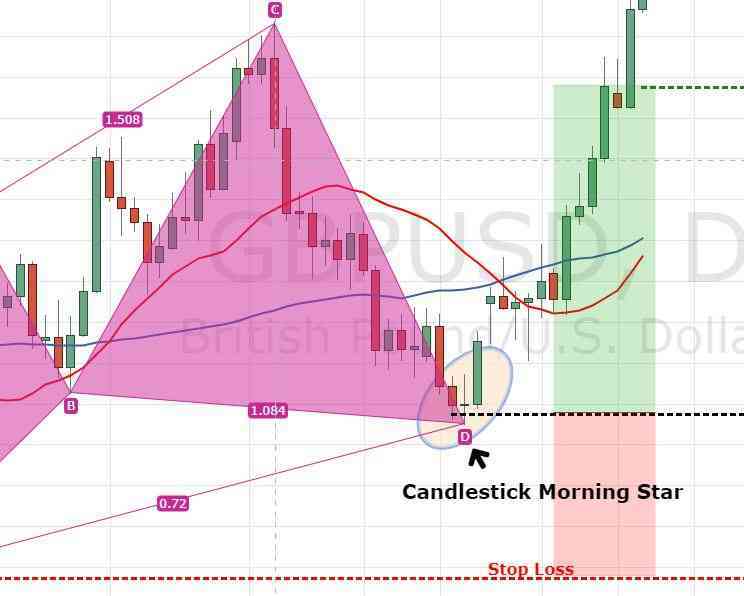 For example, on the GBPUSD chart above, a bullish reversal is confirmed by the formation of the Morning Star candlestick pattern. After opening the position of the Cypher Harmonic Pattern trading signal, consider also to set profit targets (TP) and Stop Loss (SL) as a form of risk management. Stop Loss limits can be placed near point X, while TP can be adjusted according to each Risk / Reward Ratio. In the example GBP / USD chart above, the Risk / Reward Ratio is 2RR with a SL 200 pips distance and TP 400 pips. Besides harmonic patterns, there is also a simpler technical analysis of chart patterns because you don't need to pay attention to Fibonacci lines.